"When Nat has been quiet for more than a minute that’s usually a sign that the level is on fire." In Now Playing articles PC Gamer writers talk about the game currently dominating their spare time. Today Pip swabs the halls with some pals. 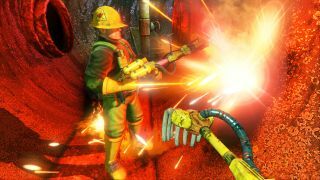 Often I think of Viscera Cleanup Detail as less of a game and more of a personality test. The debacle revolves around you and a group of friends acting as FPS janitors, cleaning up after the monster-shooting is over. There are bullet casings to collect, thoraxes to incinerate and USB sticks to gather from fallen allies. It’s a cleaning sim. It has the appeal of bringing order to a disordered world through the act of mopping. I sometimes wonder whether the developer, RuneStorm, would ever make the accompanying FPS so that players could generate unique hellscapes and then the cleanup detail could tidy those. But that’s beside the point. The point right now is that, in playing scenarios with friends, you learn a lot about those friends. I am one of nature’s tidiers. I didn’t used to be but suddenly a switch flipped and I can now happily spend an hour folding laundry into cuboids. In Viscera, I am the boring one. While everyone else is larking about, playing games of catch with an errant mandible, I will be scrubbing bloodstains from walls. I listen to the banter but don’t chip in for fear of reminding people I’m not skiving off. My friend Dan can be similarly tidy. When left to ourselves we obsess over tiny blips on the mess detection device, wrangling the whole area into terrifying spotlessness. He’s more prone to joining in the fun, though. He’ll abandon his grim bucket of slop and take a break for the right japes. My partner is a stop further along the scale. He’ll get around to tidying eventually, but will also gleefully break the only lift on the level and chuck barrels beyond the scenario’s boundary just to see what happens. When he turns up, Dan will abandon me in a fit of giggles. Then something will explode and there will be a guilty silence from the pair of them. Alice marries inexplicable efficiency with the ability to seem like she’s just titting about. Her banter game never drops below a ten so I assume her area is a tip, then I’ll turn up and wherever she’s been will be immaculate. I feel like Viscera might be her natural esport. Then there’s Nat. Nat will always find the laser welder. The laser welder is supposed to be for removing bullet holes from walls and fixing lightning scars. It can also overheat and start shooting fireballs into the level, burning everything and leaving a sooty mess. When Nat has been quiet for more than a minute that’s usually a sign that the level is on fire. The thing here is that I don’t like playing Viscera alone. I need my friends to flesh out the experience. Nat means I have soot to clean up. Dan is a vital ally when I say, “We should get on with this...”, and Alice and my partner add a clownish radio drama (“Oops, was that your body bag?”) and concerning vagueness (“Oh that’s what that does!”). Together we are a glorious, inefficient cleaning machine.